Who is it who is who knows everything about you, cares the most about you, thinks about you the most, and want to do something better for you more than everyone else? Obviously, It is none other than your own ‘self’. You are the most important person in this world for you, just like everyone else is for themselves. Your wants, happiness and life are the biggest concern for you, at least more than anyone else. No matter even if you claim that it is someone else, because it is really always you. How much you are unaware of it, seeking the answers outside, when they all already exist within you. Aware of all the truths, and yet pretending to be unaware of the power that you hold, and the wisdom that you own. Call it your mind, heart, soul or something else. What we know above all is that, ‘it is our own self’. The one which we exist as, and the one which is above all. Above are, few of those many things which happen to us, or which we let them happen to us. But the one biggest (sometimes the only one) reason why these things happen to us is because, we underestimate our ‘self’, and prefer hearing the outer voices which we think are much sincere and intelligent ones than our own. But while doing this, don’t we unknowingly make ourselves feel less than what we actually are? Don’t we know the answers for all the questions of our intuition, for we search the answers outside? Don’t we make our own existence vain for us? However, it isn’t totally our fault to not trust and know our ‘self’, as many times we get lost and find no answers for our problems, we can’t know everything and need some assistance, we become too weak and it becomes tough to believe in our ‘self’. But these are also the times when we need our ‘self’ the most, and shouldn’t misjudge it. Look back at the whole journey of your life, and then think over it once, that who was it who was always there for you? From when you were going through the hardest times or experiencing the other dimensions of life, till where you are today, when you can clearly see your life as it passed and exist in peace. The only answer which I can guess, and which is the truest is ‘you’. And it the most just answer too! Because it has always been you, and it will always be you. And still waits for you to know his/her value. 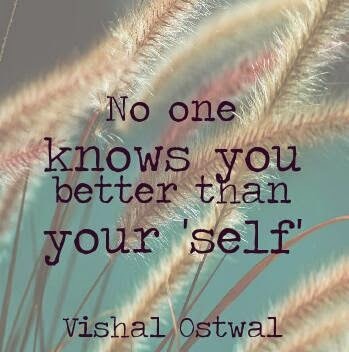 That person is no one else other than your own ‘self’. You are one who knows all your potential, desires, problems, confusions, feelings, solutions, joys and principles. Only you! So, trust your ‘self’ and go with it, not against it. Know it better, share your company with your ‘self’, ask your questions to it, and it will surely answer. It is a part of you. Actually, it is you. Conclusion: There is no one in this or any other world, who knows you better than your ‘self’. It knows all your why’s, how’s, what’s and all, because it is you. Believe in it, ask it, listen to it, and go on with it. Everything and everyone else are like the spectators, but you’ve experienced it all yourself, with your ‘self’.